It is our first choice among the many winter sports that draw us outside during the colder months. And it is something that everyone who calls Innsbruck their home has in common: the locals, the students and the many other people from different countries who only came to Innsbruck for a short visit but fell in love with the place and never left. It is high time, then, that we introduce you to the alpine-urban benefits of Innsbruck and the ski resorts in Olympia SkiWorld Innsbruck. Snowboarding, freeriding, freestyle skiing, figln and ski touring. 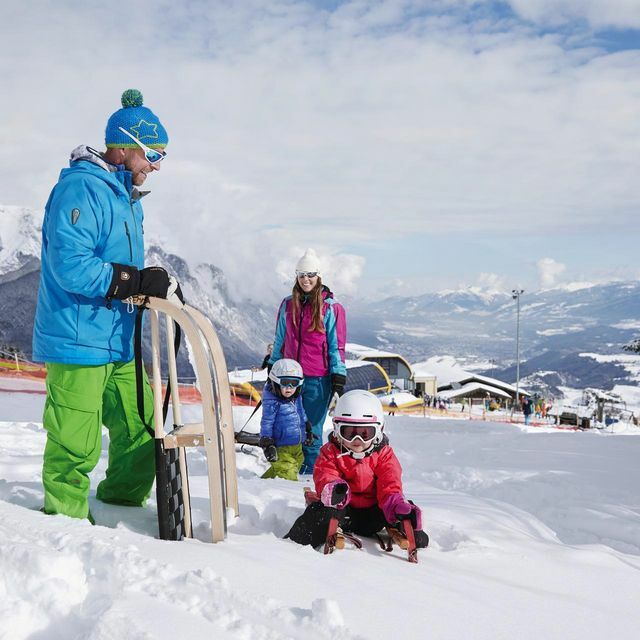 These great options give you a huge range of sports to choose from – both on and off the official pistes. City or mountains? You can decide where to stay during your holiday. What would you prefer? Having a short drive to the ski resorts every day but getting the benefits of the city? Or a hotel that is just a couple of steps from the slopes? Ski-in/ski-out accommodation is available, for example, in Kühtai or Axamer Lizum. It is our favourite sport right after skiing. You don't need any prior experience to go tobogganing and there is no minimum age requirement – tobogganing really is for everyone. Children aged 2 and over will have loads of fun tirelessly climbing up and sliding down little sledding hills. Small children can also join adults on longer tobogganing adventures. At the top of the walk up, there is normally a mountain hut where you can enjoy hearty dishes, Tyrolean cuisine and delicious cakes, maybe even accompanied by a beer or a schnapps. There is no need to hold back on the food, after all you worked hard to get there. We are not always that athletic. Sometimes we like going tobogganing without having to walk up. Then we choose one of the toboggan runs where you can take a lift or cable car up to the top. It saves a lot of time and means you can sledge down several times. Plus, you are also still welcome at the mountain hut of course. Have we convinced you to give tobogganing a try? If so, check out our tips for toboggan runs and our information about toboggan rental. Cross-country skiing is wonderful winter fun. In Tyrol, it is perhaps not as common as alpine skiing, but it is a real treat in the fresh air. Our cross-country ski trails are kept in an absolutely exceptional condition. Whether classic or skating, we make sure the trails are prepared to the highest standard. 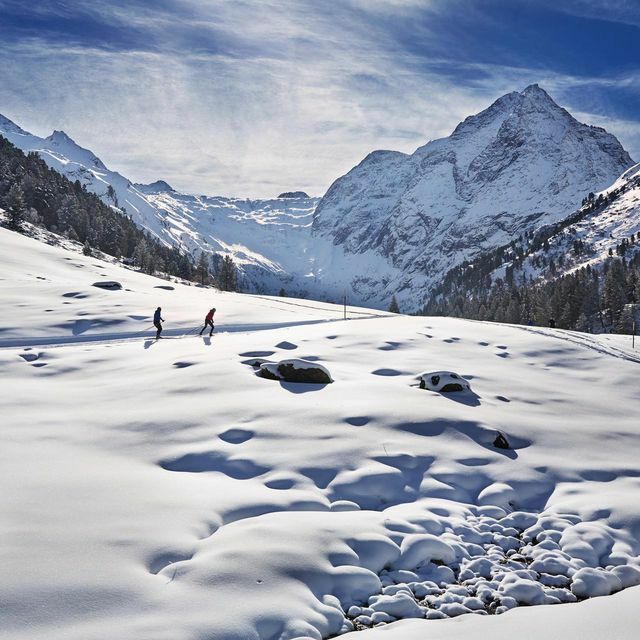 Will you join us for some cross-country skiing? Check out our selection of trails. You will love the views. A leisurely afternoon? - No, excitement! 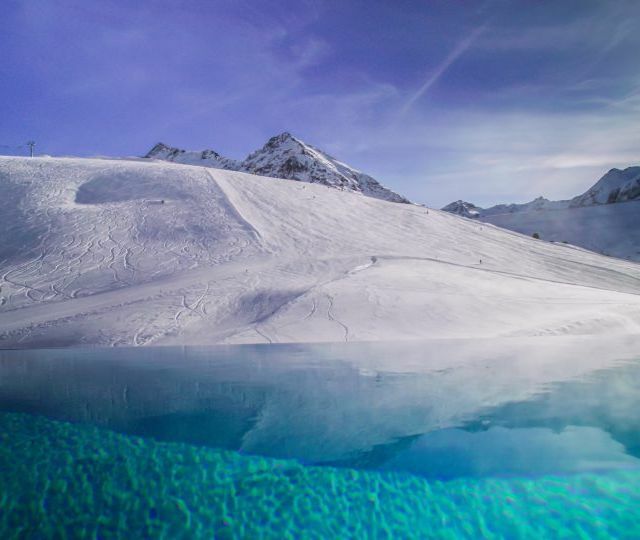 When temperatures drop below zero, we can't stop thinking about the ice. It offers more possibilities than almost any other element. Our top hits on the ice: guest bobsleigh rides, ice skating and ice climbing. 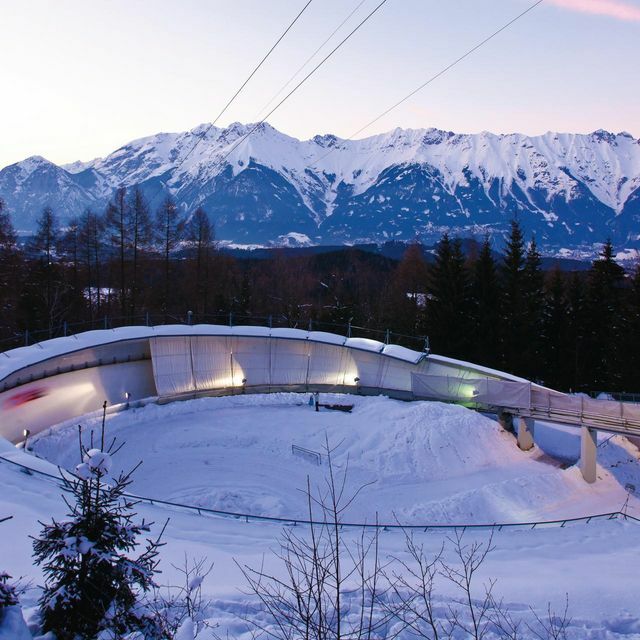 Do you dare venture onto the Olympic ice track in Igls? World Champions have been crowned on this track and you can race down it in a guest bobsleigh. Experience what it means to speed around the "Kreisel" spiral at supersonic speed. What an adventure! Whether in the heart of the city or an idyllic alpine setting: ice skating is a winter must. Preferably with stunning views of the surrounding mountains, which seem to grow right up out of the city. Do you dare take on the vertical ice? Ice climbing requires a lot of courage when scaling sheer ice on frozen waterfalls. This is particularly fun on our well-maintained and vehicle-free winter hiking trails. This is just like winter hiking except off the beaten track and a bit more strenuous. It is perfect for anyone who likes to get away from it all. Get to know Bikepark Innsbruck in Winter. Fat bikes have extra-wide tyres to make them snow-ready. At the end, you ride down the steep mountain slopes into the valley. At our ski resorts. See how the pistes and lifts look right now. An absolute must-see! The atmosphere is amazing when the best ski jumpers in the world soar off the jump and fly down into the stadium. Every winter at the beginning of January. Free transport to the ski resorts in Olympia SkiWorld Innsbruck. Leave your car behind and take the free ski bus from Innsbruck to the slopes. Und was ist die Meinung unserer Blogger? The official app for the Innsbruck region. Comprehensive maps with GPS functionality for attractions, restaurants, shops and much more. Includes a read-aloud option and offline availability. Our brochures include holiday planning tips, ideas for tours and excursions, information about the free hiking programme and much more. Simply download or order a brochure now.